We sponsor a variety of events at St. George's Church and participate in many community events in the Village of Hilton. We'd love to have you come and join us for these events. The best way to keep up with our activities is to check out our Facebook page (link below). There will be an Easter Scavenger Hunt for our youngest members following the Easter worship service and Easter Goodies for all children. **UPDATE** CLICK HERE ​to see pictures from Holy Week events. 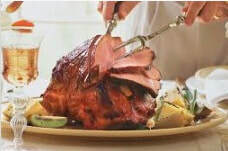 Immediately following our Palm Sunday worship service, we will be treated to a baked ham luncheon cooked by Dan Weber and Stef Miller. It should be a wonderfully delicious way to celebrate. **UPDATE** CLICK HERE to see pictures from this event. 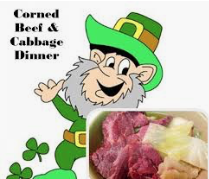 Join us for a delicious dinner of corned beef, cabbage, carrots, potatoes, rolls and dessert! An bring your family and friends too! Tickets are $12, available at church from Steph Miller or at the door. Join us each week during Lent after our regular worship service for a luncheon of soup and bread and a discussion led by various parishioners to help us reflect on our faith journey during the season of Lent. Join us for this solemn worship service to begin the Lenten season. Join us to restock your good reads, CDs and DVDs to beat the winter blues! Enjoy a fresh baked treat and hot beverage or purchase a treat to take home. Paperbacks $.50, Hardcovers $1.00, CDs and DVDs $1.00. Special pricing during the last hour of the sale. Bring your unneeded, old electronics to our church parking lot and it will be recycled appropriately. And for every ton we collect, SunnKing Electronics Recycling will make a donation to Camp Good Days and Special Times to support kids with cancer and their families. We will have volunteers waiting to unload your car. And, new this year, we are also holding a Used Media Sale and a Baked Food Sale in the church at the same time! Please join us for worship on Sunday, January 27th, at 10:00 AM to help us celebrate the sacrament of Holy Baptism as we welcome Mackenna Chapin Pappert, daughter of Rick and and Katie Pappert, into the family of God! **UPDATE** CLICK HERE to see pictures from today's event. Rt. Rev. Bishop Prince Singh will be visiting us and worshiping with us on Sunday, January 13th. Following the service there will be a Q&A with the Bishop and a breakfast together. Join us at 7:00 PM for a festive candlelight worship service as we celebrate the birth of Christ! **UPDATE** CLICK HERE to see pictures from this service. Visit our SUNDAY SCHOOL page or our YOUTH GROUP page to find the text and video of the presentations made by our children. ​ be invited to take a sampling of cookies home to enjoy! **UPDATE** CLICK HERE to see pictures from today's event! Bunting, decorate our outdoor trees and enjoy Christmas cookies and cocoa to end the evening. ​ Christmas cheer to the residents there. The church will provide the turkey and we are asking everyone to bring a dish to pass. Spend some time with us after the worship service to join in great food, excellent conversation, and a time to express how thankful we are for each other and God's gifts! Join us on November 3rd for our annual craft show and baked food sale. 30 vendors, a table of crafts made by our parishioners, and a table overflowing with baked goods hosted by our Youth Group! ​**UPDATE** CLICK HERE to see pictures from today's event! Come to the Hilton Apple Fest and while you are there, visit the St. George's Apple Sausage Booth and grab some really good eats! This will be the best sausage you have ever tasted! Join us this Sunday for our Apple Crisp Bake-Off! Bake your favorite apple crisp recipe and bring it to church to share and you will be entered to win a Tops Gift Card! Bring your appetite too for a delicious tasting of apple crisps during coffee hour! On September 16th we will be welcoming back our children to a new year of Sunday School and we will celebrate with Make-Your-Own Ice Cream Sundays during coffee hour! We will kick off a new year of learning and growing together in faith on September 16th. We are reorganizing our Sunday School a bit again this year in order to meet the changing ages and needs of our students. This is what it will look like this year. CLICK HERE to visit our Sunday School page.